The Alliance Party and Socialist Worker are jointly launching a nationwide tax campaign on Saturday 22 May. The campaign will champion tax changes that will benefit grassroots New Zealanders. “These two demands will address injustices in the current tax system, which sees grassroots people having to pay tax on one of life’s necessities, food, while financial speculation goes untaxed,” says campaign coordinator Vaughan Gunson. 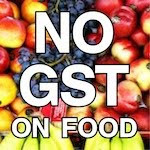 “This injustice will be made worse when the National government delivers the 2010 budget, where GST will almost certainly be increased to 15%,” says Gunson.